I'm not sure I've ever had my picture taken with someone who's died two weeks later. Based on my eight seconds of interaction with him and watching him interact with other people at the Big Apple BBQ, he seemed like a genuinely nice guy who truly enjoyed what he was doing. And, yes, he insisted that I do the thumbs up. Rest in peace, Billy Mays. I'll leave the snarky jokes to the rest of the Internet. Sometimes I get annoyed by the people who film shows on their crappy cameras (mainly because they are doing it in my sightline, so I wind up watching the show through a three-inch screen), but then there are times like this, when young Henry's dancing during Lucero's "Tears Don't Matter Much" at the Big Apple BBQ is captured for the ages, from multiple angles. The best dancing angle is the first one, but you can see the band's reactions better (and hear the song better) in the second. From any angle, though, it's still awesome. And one more reason why live music rules. I had thought about going to the Clearwater Hudson River Revival earlier in the year, but then I ran into the big problem I always hit with festivals: what if I shell out this money and I wind up drenched, irritable, and surrounded by thousands of mud-caked hippies? Even though it was pretty cheap ($65/day in advance) and a portion of the money was going to a good cause (in Clearwater's case, preserving the Hudson River), it's still hard to justify spending money you probably shouldn't be spending in These Difficult Times when faced with the possibility of weather-induced madness. So, I thought, "Maybe next year, Clearwater." Until Wednesday of last week, when my friend (thanks. Josh) forwarded me an e-mail from the DJ of "Crash on the Levee," a roots music show on WFDU, a station I would listen to more if, in fact, I could get its signal in my apartment (I know, I know, it streams on the Web...OK, I'll go stream it now). That e-mail brought word of a drawing for free tickets to your day of choice at Clearwater. I figured I'd used up my contest-winning mojo after getting the Hank Jr. tickets, but ultimately thought it couldn't hurt to press my luck (no whammies!). The winners would be chosen Friday morning. Friday morning came and went, and no word, so I figured I was back to being a loser. Then I checked my e-mail as I got ready to leave for work and, lo and behold, I'm a winner (thanks, Jerry Treacy). Clearwater, here I come! On about five hours' sleep after the Old 97's show at Maxwell's! Now, having gone to the Revival, I can't recommend it enough. The music was great, the vibe was cool, and, really, the hippies weren't that dirty. For those who don't know (and I'm sorry, people who do know, you'll have to read this, too), the two-day Clearwater Hudson River Revival, held in Croton Point Park in Croton-on-Hudson, NY, is in its 40th year. Its figurehead is Pete Seeger, who has devoted a good deal of his 90 years to cleaning up the Hudson River and getting the young and old to join him in his quest. Mr. Seeger performs throughout the weekend, though he is far from the only musical act of note. This year, on the day I went, the festival hosted Alejandro Escovedo, Old Crow Medicine Show, Allison Moorer, A.C. Newman, Richie Havens, Dr. Dog, and Susan Tedeschi, among others (Sunday featured Taj Mahal, Arlo Guthrie, the Persuasions, Grace Potter and the Nocturnals and a bunch more). But music isn't the only thing going on at the festival. There's also kayaking, trips on the Clearwater sloop, a slew of arts and crafts vendors, a green living expo, and, of course, an activists' area where you can find information about just any cause you might be interested in, from saving Darfur to keeping violent toys out of the hands of your children. And there's also some creative marketing involved to get people interested in your cause. I spent some time checking out just about every area, but the bulk of my day was spent moving around from stage to stage. As soon as I got in, I headed to the Hudson River Stage, where Pete Seeger was playing with a group of fourth-grade students (and some adults) from Forrestal Elementary School in Beacon, NY, known as the Kids from Room 12. They sang songs about the river, President Obama, and preserving the earth, with Mr. Seeger strumming the banjo (and letting loose a solo or two) and urging the crowd to join in the fun. As I walked to Grand Central in the morning, I figured it couldn't hurt to print out one of the photos I took of Mr. Seeger at the Teachers College show earlier this year, on the off chance that he might sign it at the festival. I didn't want to harass a 90-year-old man into signing a picture for me (like these mongrels), but, I figured, if I saw him signing things at the festival, I'd be upset that I didn't have one of the photos to sign. So, after the show, I headed around to the backstage area to see if I could get the photo signed. A few other people had the same idea, so when Mr. Seeger emerged, he begged off, saying he was late getting to another stage before walking away. As several of us followed him, he began looking for one of the golf carts, so he could make a quicker getaway. The Seegermobile followed close behind, and soon he was on his way to another gig. Or just to get away from us. Either way, cool with me. I went back to the main stage to see Alejandro Escovedo, who was playing in his trio format (with Susan Voelz on violin and David Pulkinhgam on guitar). Before his set started, though, Mr. Seeger came back to get some grapes and chat briefly with Escovedo (two more people asked him to sign as I lingered in the background, but they were rebuffed for the same reason as before). Escovedo's set was solid as usual, with highlights being the frenzied interplay with Voelz and Pulkingham on "Everybody Loves Me," the aching beauty of "Rosalie," and, naturally, the set-closing "Castanets," which, like all the songs performed on the festival's two main stages, was also interpreted for the hearing-impaired by an ASL interpreter. It's a nice thing to do, though if I were deaf, I can't imagine the first place I'd want to go on a wet spring afternoon would be a music festival. In any event, I spent a lot of time watching the interpreters, and each had her own style (one seemed to be getting judged on her effectiveness and/or aided by another woman during A.C. Newman's set). Oddly, some kept signing during instrumental breaks, so, like Elaine Benes before me, I began to wonder if the deaf people weren't having a good laugh at the rest of us. Many of the performers also seemed to be intrigued by the ASL interpreters, with Allison Moorer even asking hers, "What happens if you get a mumbler? I mean, what if you get Joe Cocker?" Moorer, who was accompanied on violin and mandolin by Eleanor Whitmore, seemed much more animated than the last few times I've seen her and, though I only saw the first and last few songs of her set because I was shuffling back and forth between her set on the Rainbow Stage and Old Crow Medicine Show's on the Hudson River Stage. But her set-ending versions of "A Change Is Gonna Come" and "Brother, Can You Spare a Dime?" were pretty damn great. Old Crow Medicine Show, whom I haven't seen live in awhile, sounded much better than I remembered (I didn't hate them live, but it just lacked that oomph, or at times seemed to have overly manufactured oomph). The start of their set brought a surge of free-dancing youth to the front of the stage, which was supposed to be kept clear for those in wheelchairs (Clearwater is as kind and considerate to those in wheelchairs as they are to the deaf). They were allowed to overtake the area for awhile before some of the Peace Keepers (the Clearwater volunteers) told them (kindly and considerately) to keep the area and the wheelchair path clear. Peace was restored, and everybody kept smiling and dancing. I caught the first 45 minutes or so of their set before wandering over to see Moorer, though I made it back in time to hear them close with a particularly rip-roaring "Union Maid." I guess I completely missed the fact that Mike Bub, formerly of the Del McCoury Band, is now Old Crow's bassist. That's quite a transition, from the reasonably reserved McCourys to the much more rambunctious (and less nattily dressed) Old Crows. No matter, he looks equally comfortable in both. Mr. Seeger, Escovedo, and Old Crow were pretty much the top three acts I wanted to see, so I spent the rest of the day wandering around, checking out the activists and vendors, and eating some good pulled pork and a giant potato pancake. I also caught some of A.C. Newman and Dr. Dog, two acts I didn't know much about heading in (though I knew that Jon Wurster, the best drummer Marah ever had and one half of the kings of comedy, Scharpling and Wurster, was playing with Newman). Both were good, and definitely worth further exploration on my part. The entertainment value of Newman's set was aided by the guy dressed up as a pirate (and brandishing a toy sword) who danced (and thrusted and parried) throughout the show. I was going to take a picture but I chickened out. Sorry. You'll have to settle for band photos of Newman and Dr. Dog (with Elvis Perkins in Dearland). Mike and Ruthy, whose second of two sets was in the dance tent, sounded great in the little time I saw them, and they were joined by fellow Mammal Tao Rodriguez-Seeger, Jay Ungar (Ruthy's dad), and Molly Mason. Ungar and Mason followed with the Waltz Hour, and for both sets, the dance floor was full of young and old, all having a good time, though from my spot in front during Mike and Ruthy's set, I saw two little boys mocking another young boy for what seemed to be the offense of dancing with a young girl. They'll learn. When I was making my way out of the vendors area, I saw a crowd of people off to the side of the Circle of Song tent. I was about to walk by but I thought I'd at least see what was going on. As I headed over, I saw the yellow raincoat of Pete Seeger, and there he was holding court among a group of acolytes. I'd abandoned the idea of getting my photo signed, but I figured it was worth one more shot, since it didn't look like he was in a rush to get anywhere. But Mr. Seeger soon told the crowd he had to be on his way, though not before telling a guy looking to get a book signed that he should try to catch him when there weren't so many people around. I was getting the distinct sense that Mr. Seeger just didn't want to be bothered and, God knows, he's earned the right. So I wandered over to the Circle of Song tent to watch some of the ukulele players. After awhile, I looked to my left, and saw both Mr. Seeger still there and people walking away with signed programs. D'oh. So I went over, and Mr. Seeger was talking to a young guy who was handing him one of his own CDs. The guy trying to get his book signed saw me and selflessly (thanks, dude) motioned me to ask Mr. Seeger to sign the photo. So now I have a photo I took of Pete Seeger signed by Pete Seeger. Pretty cool. Oh yeah. I'm pretty sure it also rained a lot. Most of the day. No big deal. He wasn't the first Dusty Rhodes I knew (that'd be this guy), but he'll always be my favorite. 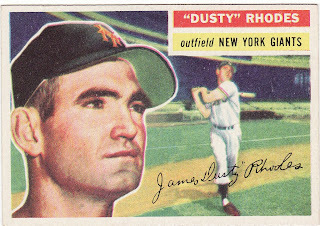 James Lamar "Dusty" Rhodes, whose pinch-hitting heroics in the 1954 World Series helped the New York Giants win their last championship, died of cardiopulmonary arrest Wednesday at the age of 82 in Las Vegas. Rhodes finished his playing career with a modest average of .253, but his crucial pinch hits in the first three games of the 1954 World Series earned him his spot in baseball history. And they were the reason I knew enough about him as a kid to ask my parents to take me to a baseball card show at the Penta Hotel in New York City (now back to being called the Hotel Pennsylvania) so I could get his autograph. Every year for my birthday and/or Christmas, my grandmother would give me one of Donald Honig's baseball books, which featured not only written tales of baseball's past, but also hundreds of photographs of old players. When I first caught the autograph bug, I guess it seemed only natural to get these books signed by some of the guys in them. So I would see an ad for a baseball card show, usually in a Friday New York Post, look to see if the former players signing at the show were in one of the books, and, if one or more of them were, would begin pleading with my mom and dad to take me into the city to get my books signed. They generally caved pretty easily, and since my dad worked across the street at Madison Square Garden, he would frequently take me in and get some extra work done while I was at the show. He was a big baseball fan when he was a kid, too (he liked the Giants, and was at the last game at the Polo Grounds), so though he probably wasn't all geared up to go into the city and do work on his day off, I think he understood. But I seem to recall that it was my mom that took me to the show where Dusty Rhodes was signing, and it might've actually been the first baseball card show I went to at the Penta (I'd been to a wrestling convention there, though, where I met Captain Lou Albano and the Haiti Kid, among others). I'm pretty sure I got Bob Feller's autograph at the same show, which means that was also the show where I wanted to get Joe DiMaggio's autograph, but they sold out of tickets before I could get one (never did get his autograph, though I bought one once that I'm pretty sure is a fake). I don't remember anything about my interaction with Feller, but I remember that when I stepped up to Dusty Rhodes's table, he was really nice and went out of his way to talk to me and just generally be cool. When you're a kid and a guy who played in a World Series (and with Willie Mays!) talks to you, it's pretty awesome. And so, after that experience, Dusty Rhodes became my new all-time favorite baseball player. I used to compile stats and give actual major leaguer names to the little red dots that were the players on my Coleco Head-to-Head Baseball game, and Dusty Rhodes quickly became my cleanup hitter on the Giants (sorry, Willie). I believe his average hovered around the .600 mark. Around the same time, I became aware of R. J. Smalling's Baseball Address Book, which listed home addresses for former major leaguers. Looking at it as an adult, that seems like a slightly creepy idea for a book, but as a kid, I thought this was the greatest book ever. I could write old ballplayers, send them a baseball card or an index card with a self-addressed stamped envelope, and maybe they'd sign the card and send it back. How cool would that be, getting mail from a former major leaguer? I looked up Dusty Rhodes's address and was surprised to see that he was living on Staten Island, probably not that far from where I lived (I didn't recognize the address, but nothing's really that far away on Staten Island). I didn't want to ring his doorbell or anything, but I did want to write him a letter and thank him for being nice to me (and update him on how well "he" was doing in Coleco Head-to-Head Baseball). So I wrote him on a sheet from a yellow legal pad, mentioning how grateful I was that he treated me so nicely (and I think I included an index card for him to sign). Wow! A ballplayer wrote me a note! And he has the same first name as me! Cool! Childhood's full of such moments of awe and wonder, but we often forget about them as we get older. I've never forgotten that note, and the nice guy that sent it to me. So, rest in peace, James "Dusty" Rhodes. Thanks for the note, and I hope today you're talking to the New York Giants fan that took me to baseball card shows and bought me lots of autograph tickets. Wish him a Happy Fathers' Day for me. It takes a lot to get me back to collecting autographs at NBC. And in case you were wondering, "a lot" translates into "Mark-Paul Gosselaar and Hank Williams Jr." OK, so maybe that's not all that much to you, but to a man who used to have a "Saved by the Bell" Shrine in his kitchen and who currently has Singin' and Dancin' Bocephi in two rooms of his apartment, it's a pretty big deal. Mark-Paul Gosselaar's appearance on "Late Night With Jimmy Fallon" served as the test run prior to Bocephus Day, to see if I actually had the energy at the age of 32 to place myself in the midst of a few dozen fairly to incredibly annoying autograph collectors for an hour or so. When I arrived around 6, things looked pretty good. There were only a few collectors lingering, and I began to feel reasonably confident that this mission would be pain-free. Then, a few more collectors showed up. And then some more. Followed by others. Soon there were about a dozen or so. There would be pain. Kelly Ripa came out first, and despite the fact that she is pretty much in the city and in public about 200 days a year, people still swarmed around her for autographs and posed photos. I watched in amusement. Amadou and Mariam came out next, and I can only assume their blindness prevented any of the collectors from asking for either their autographs or pictures with them, as anyone who comes off the elevators escorted by NBC security is usually swarmed, or at least bothered by a few people. The Zack Watchers stayed put, and kept their eyes glued to the elevator bank, waiting for Mr. Gosselaar to be released. After awhile, he came down, carrying a guitar. Security reiterated their policy of only letting celebrities sign outside of the lobby, which doesn't make much sense at all, because instead of a small crowd of people in the contained lobby, you wind up with an unruly mob on the street. But what do I know? As I made my way outside, I overheard Mr. Gosselaar saying he was only going to sign about five or six and then jet. So I needed to get in good position quickly. The mob had already coalesced outside, so things looked grim. I tried to respectfully put forth my Bayside Tigers t-shirt, but that strategy didn't work so well (one of the security guys told me not to go over top of people, which, considering my height relative to the other collectors, was a challenge). Then, as he was getting ready to call it quits, he spotted the t-shirt and signed it, as about eight other people tried to hoist things on top of it. They failed. I won. Good time to note I'm still single, ladies. Applications still being accepted. And, by the way, if you haven't yet seen Mr. Gosselaar's appearance on the show, you must check it out. It's amazing. After the successful test run, I was feeling pretty good about Bocephus Day. I figured there'd be a few collectors out with pickguards and old vinyl and that the quasi-mob of people who greeted Bocephus the last time I saw him at NBC would probably re-emerge, but, overall, I felt like I could handle it. I brought four albums, hoping to just get one signed, and to maybe get a better signature than the scrawls I got on the albums last time. There were only one or two other collectors interested in Bocephus, and I spent most of the time talking to one of them I remembered from the old days. We reminisced about how easy it used to be, and "Live at Five," and waiting in the lobby without being harassed by security. Soon after, we were harassed by security and told to wait outside. Since there were cars waiting on both sides of the building, we had hoped to stay inside to see which way Bocephus was headed. But with that dream dashed, we headed outside to where we thought the Bocephusmobile (an SUV we knew was his because another collector had seen him going in) was waiting. It wasn't. So we scurried to the other side. And found about 50 people blocking pedestrian traffic and staring at the revolving doors, hoping to pounce on Selena Gomez when she emerged. My collector friend and I had just about given up hope (even if Bocephus came out this side, we surmised, he'd be swarmed, largely by people who had been completely oblivious to his existence eighteen seconds ago) and started to head over to check on the other side when the band came out. So that was a good sign. But there was still no Bocephusmobile around. My collector friend went to check the other side, and I followed behind. There was still no Bocephusmobile on the other side, so I hemmed and hawed and finally darted back to the mob. And then, Bocephus emerged. I quickly positioned myself outside the revolving doors, along with a few other collectors (including my collector friend, who darted over at the sight of Bocephus). As the crowd began to see security and the development of a general hubbub, they braced themselves for Selena Gomez. A young girl screamed in anticipation. People jockeyed for a good photo. And then a guy in camo with an unlit cigar in his mouth came out. Despite not being Selena Gomez, Bocephus got a hearty reception from people whispering "Who is that?" before asking if they could take a picture with him. After I got my album signed, I tried to get in a position to take a picture with him, but was being cut off by his new fanbase. However, luck shined down on Tinsel and Rot, because the Bocephusmobile was not there, so he was just stuck there in the crowd. One of the guys in his crew heard my collector friend ask for a picture with him, and said, "Sure, why not? Car's not here, so we aint going anywhere." And so pictures were taken. And, no, I don't know what that thing on his neck is. I still had my other three albums, and Bocephus was still standing there doing nothing, so I asked the guy who took the picture if Bocephus wouldn't mind signing my other three albums (I added, "I don't want to be greedy," because I didn't). The guy grabbed my albums and gave him to Bocephus, capping off a swell return to the world of collecting. I didn't watch the Bocephus spot on the show, but this Web-only performance is pretty entertaining. I'm definitely turning the corner on Jimmy Fallon. I had hedged my bets a little bit, because I was one of the lucky few selected to see a live Bocephus performance at Sirius XM Studios. I figured if I didn't get any albums signed at NBC, I'd probably have a better shot at Sirius XM. Now, I had no need to bring any records with me, but, well, you know, I had a few more at home. So I brought two more because ... why not? And I was still hoping for a decent signature. I was actually pretty happy just to be in the Sirius XM offices, since I listen every day (mainly to Howard Stern, but also to Elizabeth Cook and Mojo Nixon on Outlaw Country). The performance space (called "The Fishbowl," because, duh, it's a studio surrounded by glass, much like a fishbowl) is right when you walk in, and when I got there, there were only six people in the chairs outside the studio. I grabbed a seat in the second row with a spot-on view of Bocephus. I had my Bocephus shirt on, and I wasn't the only one. In fact, the guy in front not only had his "That's How We Do It in Bama" shirt on, but he also brought his Hank Jr. flag. Nice. The interview/performance (for the "Artist Confidential" series, and to be aired next month) was pretty entertaining, and definitely worth taking a half-day at work. Bocephus and band played six songs, I think (including "All My Rowdy Friends Have Settled Down" and "Whiskey Bent and Hell Bound," which was almost ruined through some Bocephusified updating of the lyrics), and the interview covered music, hunting, and war munitions collecting. Despite the constant mention of "Bobbie Rock" (Kid Rock to me and you) and your standard Bocephus grandiosity, the interview wasn't bad. One highlight came after the interviewer asked if, because Bocephus does so few concerts these days, if the shows are more special for the fans. Bocephus responded by recounting how--"I'm not gonna mention figures"--the merch haul in Evansville, Indiana--"where there's Whirlpool and not much else"--was just unbelievable. He even talked to some NFL guys about how much they took in, and they were stunned. Good answer, Bocephus. That moment was topped only by the interview's end, which went something like this. Interviewer: "You feel like doing another one?" And then he got up and left. He came out to talk to the fans (particularly a kid who came with, I assume, his dad, and, to Bocephus's amazement, was an Ohio State fan) and take pictures (my camera's batteries died, thus preventing my third photo in the series). He was quite nice, and, yes, I got my other two albums signed, bringing the two-day total to six. All scrawls, but there's something to be said for consistency. I promise, though, that these successes will not thrust me back into the NYC autograph collecting scene. Until that "Saved By the Bell" reunion. Make it happen, Fallon. I realized the other day that my chances to get out to a Newark Bears game before the All-Star Break were getting slimmer and slimmer. So, since I wasn't doing anything on Sunday, the weather was looking good, and it was the latest Legends Sunday at Bears and Eagles Stadium in Newark, off to Brick City I went. In an effort to get more people out to the park, the Bears have designated each Sunday home game as Legends Sunday, with a free autograph signing from a major league baseball legend. "Legend" is used perhaps a bit broadly, and was almost used way too broadly last Sunday, when the Bears planned to welcome alleged problem drinker Jim Leyritz to meet the kids. People got a little upset, so he was replaced on short notice by Roy White, slightly more of a legend and not, as far as I know, currently awaiting trial on charges of vehicular manslaughter. Extending the invite to Leyritz, while perhaps well intentioned (he is, after all, innocent until proven guilty), may not have been the best PR move. Then again, it got the Bears some coverage. Since the team is under new ownership after going bankrupt in the off-season, I get the sense they would have Child Waterboarding Night if they thought it would get people talking about the Bears. In any event, this week's Legends Sunday guest was Joe Pepitone, who pretty much looked exactly like you'd think Joe Pepitone would look. And by that, I mean he was wearing a track suit. For some reason, they made him throw two first pitches. His first one was the better of the two, but here's the second one. He didn't Baba Booey it. There are a few changes at Bears and Eagles Riverfront Stadium, including a faux brick (re: chintzy wallpaper) wall in the outfield, an egregious switch in the chicken tenders, and both a redesigned Ruppert (the main mascot) and a brand-new female mascot, Effa, named after Effa Manley, former Newark Eagles owner and the only woman in the National Baseball Hall of Fame. Ruppert still seems to be the more popular mascot (even when, as below, he is playing keep-away with a kid's hat), but Effa was a hit with the ladies. The coaching staff for the Bears is all new, too, and though it features former White Sox star Tim (I'm not calling him Rock) Raines as manager and New York Met pitching great Mike Torrez (seen above in the Pepitone picture), the true star is former White Sox megalegend and New Jersey's own Ron Karkovice. OK, maybe he's not a megalegend to you. But to my grammar school friend Brian and I, he was the absolute best ever. I'm not sure why we came to this conclusion (we also liked Met Jack Savage for similarly unknown reasons), but we did, and I definitely sent him baseball cards in the mail to sign, and he absolutely sent them back promptly. So he's forever aces in my book. Plus, I just liked that White Sox team, with Raines, Robin Ventura, Bobby Thigpen, Craig Grebeck, Lance Johnson, Greg Hibbard, and the similarly awesome Jack McDowell, among others. I wish they'd all come to coach in Newark, but I'll take Raines and Karkovice. Here's my hero. Unfortunately, I couldn't get Karkovice's attention after the game (and I wore my "Officer Karkovice" t-shirt for the occasion), so our face-to-face meeting will have to wait until later in the season. I did get Tim Raines to sign one of my White Sox yearbooks after the game, though, which was a pleasant surprise, because I'd heard he didn't sign that much at the stadium. The Bears management has also decided to try to stock the roster with as many former major leaguers as possible. So the Bears, who last year only really had sausage beater Randall Simon as their former major leaguer, now have Jay Gibbons, Shawn Chacon, Carl Everett, and Keith Foulke (though I heard rumblings at the stadium that he may be gone...former major leaguer Rob Mackowiak was signed by the Indians this weekend, thus ending his brief Bears career). And, unfortunately, they now also have Armando Benitez, who I think could easily retire from baseball entirely and be a millionaire if he just decided to sell signed baseballs that read "I'm sorry that I sucked, Armando Benitez" to the people of New York and Baltimore. If you're reading this, Armando, get in touch and we'll see if we can make this business venture happen. Alas, the Bears didn't have a lead in the late innings, so it wasn't necessary to call in Benitez from the bullpen to blow the game. The Bears lost 3-1 to the Southern Maryland Blue Crabs (wearing their traditional Blue Crab Red) without his contributions (and Everett's, who was likely given the day off after Saturday's doubleheader), thus slipping further behind the Freedom Division-leading Somerset Patriots. There were still lots of empty seats at the stadium, so Legends Sunday and the new roster don't seem to be doing much to help the Bears out of their attendance rut. Every time I go to a game, I'm amazed at how they're able to stay afloat. And when I read of their bankruptcy last year, I was sad but not shocked. I don't know how long the Bears will be around, but as long as they are, I'll be out there a few times a year. Tickets are cheap (they top out at $12, though someone gave me a free ticket as I walked up to the box office...fear not, I still gave the Bears money by buying a t-shirt I didn't really need), you can see some former major leaguers, and you can ogle Ron Karkovice all day. What's not to love? With all due respect to Misters Holly, Valens, and Richardson, I suggest that today is truly the day the music died, as it is the day that the powers that be at the National Academy of Recording Arts and Sciences decided to eliminate the Best Polka Album category. Thus, barring some sort of crazy miracle in which he wins a folk music Grammy, Jimmy Sturr will never be introduced as "19-time Grammy winner Jimmy Sturr." Bury the rags deep in your face. In better news, (a) there will be a new category for best Americana album and (b) Mr. Sturr has wisely returned to using polka-related puns for the titles of his albums, as his next will be entitled "Polka Cola."